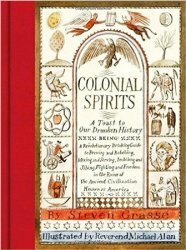 The book features a rousing timeline of colonial imbibing and a cultural overview of a dizzying number of drinks: beer, rum and punch; temperance drinks; liqueurs and cordials; medicinal beverages; cider; wine, whiskey, and bourbon—all peppered with liquored-up adages from our founding fathers. There is also expert guidance on DIY methods for home brewing. Imbibe your way through each chapter, with recipes like the Philadelphia Fish House Punch (a crowd pleaser!) and Snakebites (drink alone!). Hot beer cocktails and rattle skulls have never been so completely irresistible.